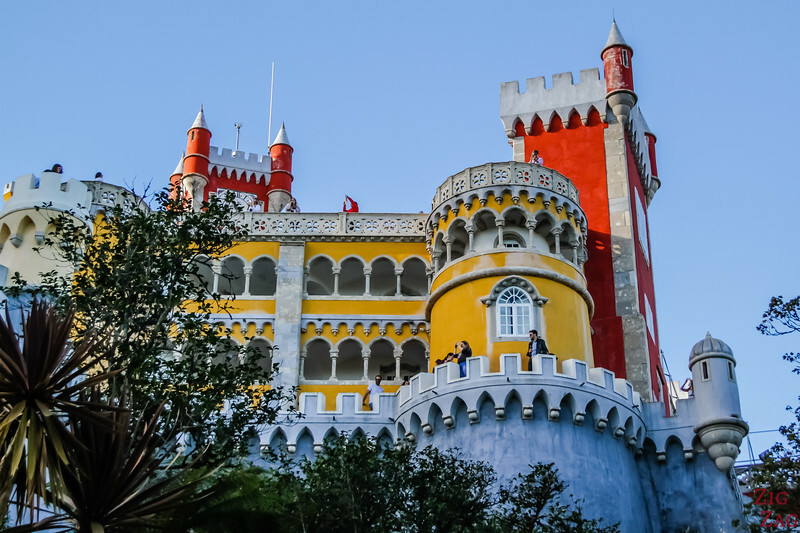 Let's start with a short video showing you the highlights of a visit to the Sintra Pena Palace : the views from the Castle of the Moors, many angles of those colorful towers as well as a visit of the inside... No wonder it is part of the Sintra ﻿Unesco World Heritage Site. 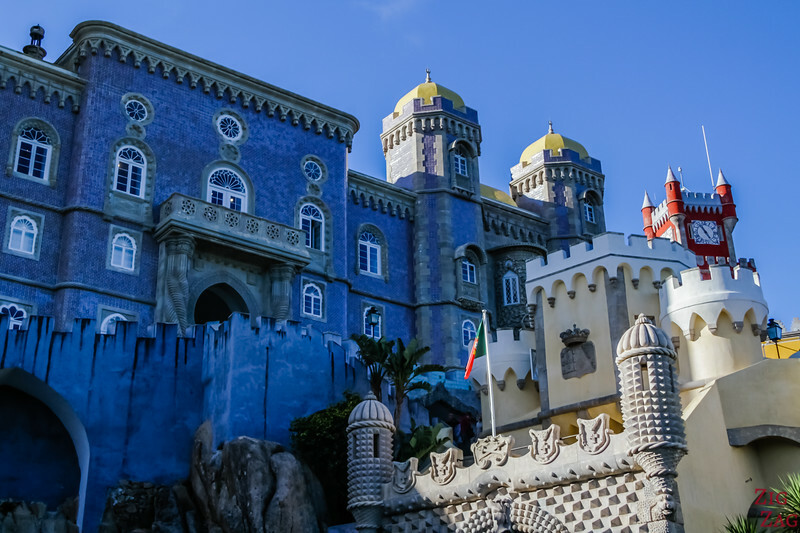 I first discovered the Palacio da Pena Sintra during my visit of the Castle of the Moors nearby. 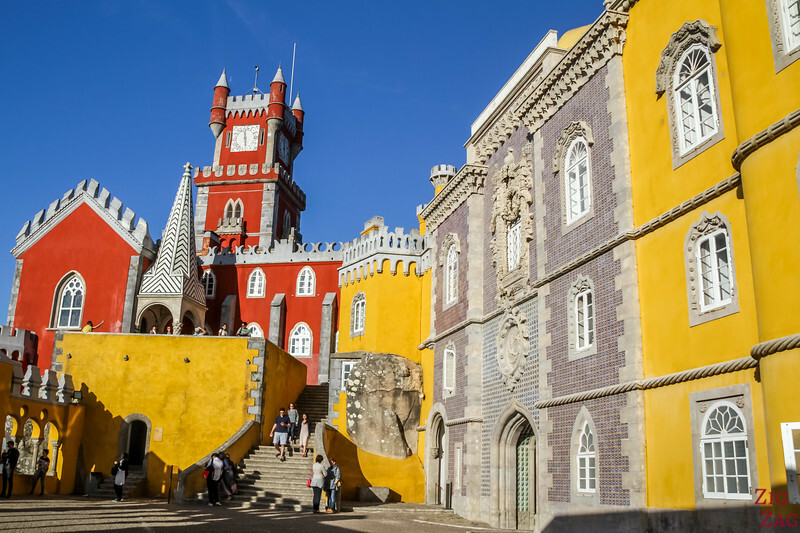 As you walk on the wall, you discover perched high on top of the hill the red tower and yellow walls of the surprising structure. 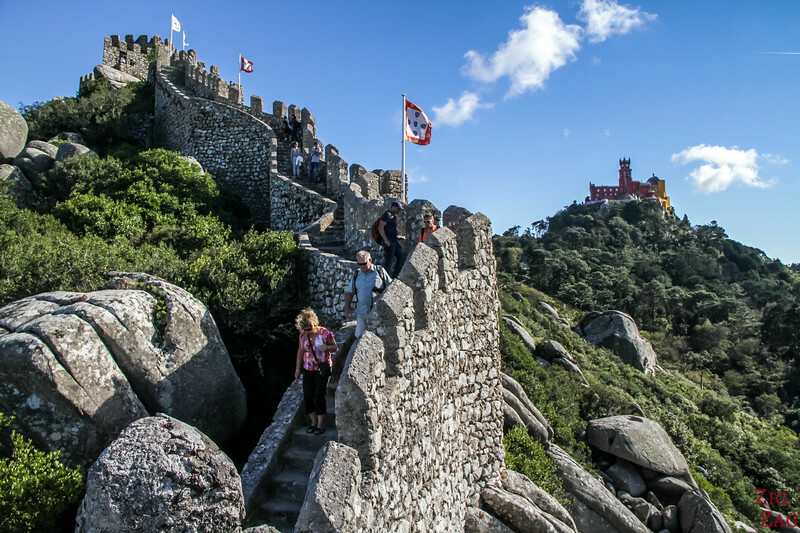 What a contrast with the old fortification of the castle! 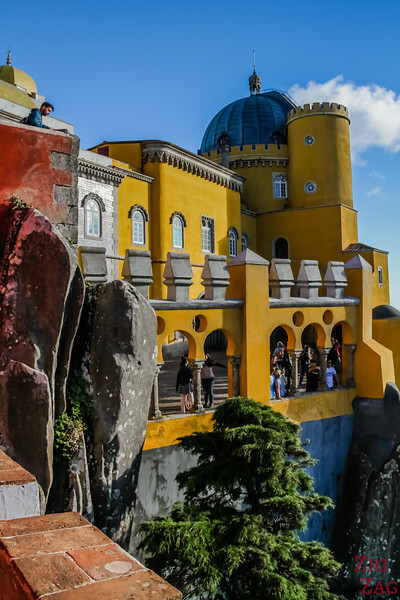 Pena Palace history in short: Originally there was just a chapel on top of the hill, then a monastery which was destroyed. 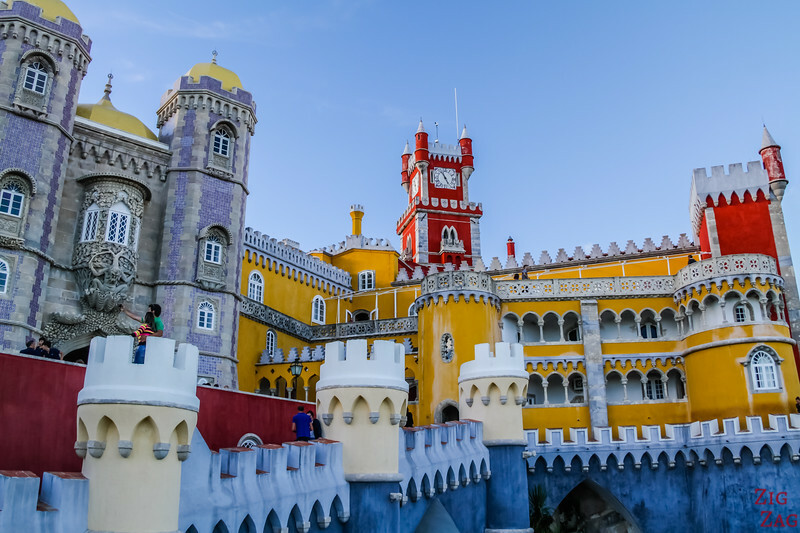 What you see today of the romantic structure, was built by King consort Ferdinand I as a summer residence in the mid 19th century. 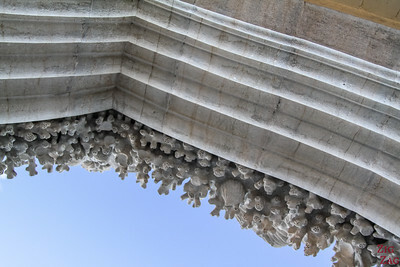 After the revolution of 1910, it became a national monument and a museum. 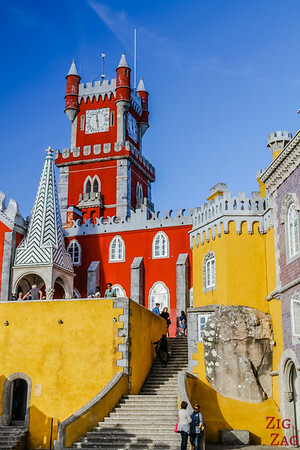 The main colors are red, yellow, blue and purple. 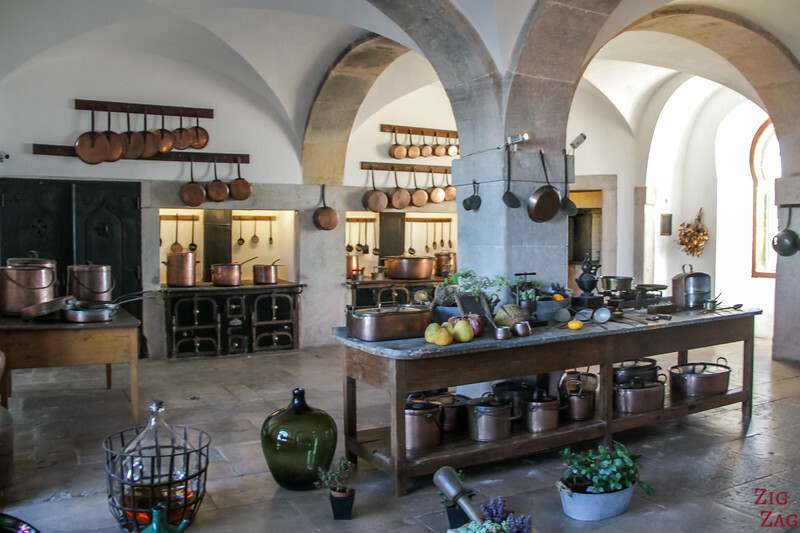 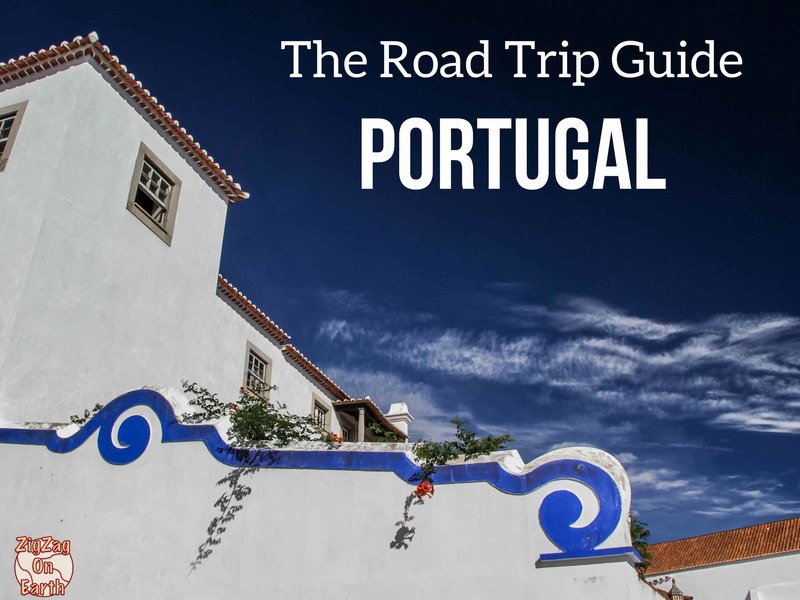 You can understand why it made it on my list of the Top Portugal Attractions , don't you? 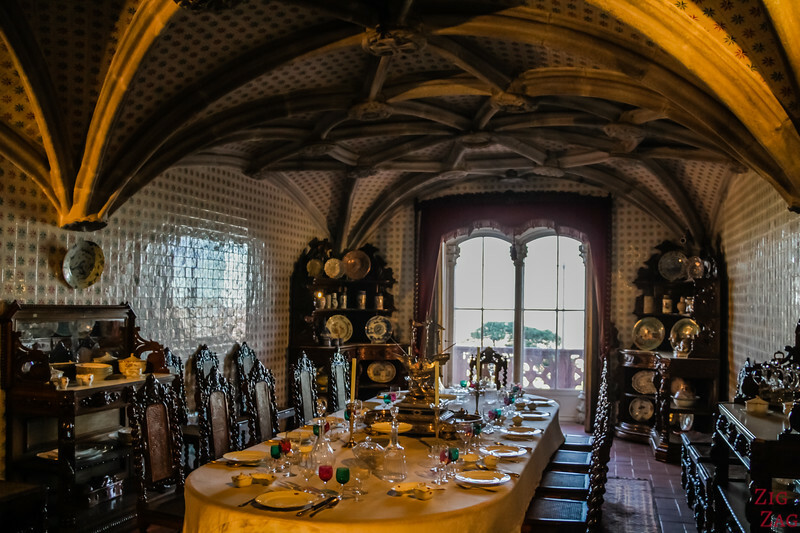 Furniture has been placed in all rooms showing how all the rooms were used. 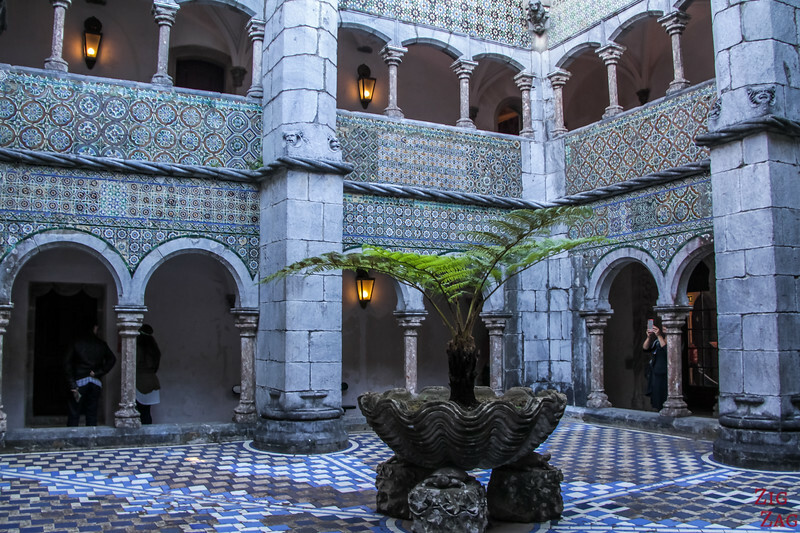 And some rooms are covered in tiles from ground to wall to ceiling. 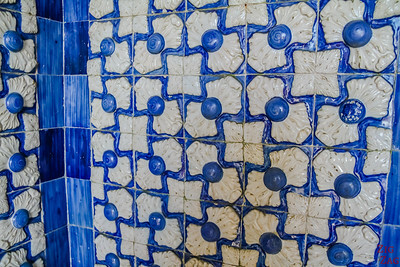 Completely tile-crazy! 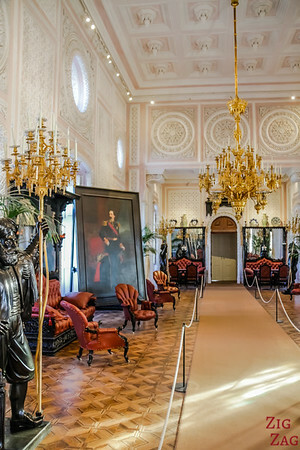 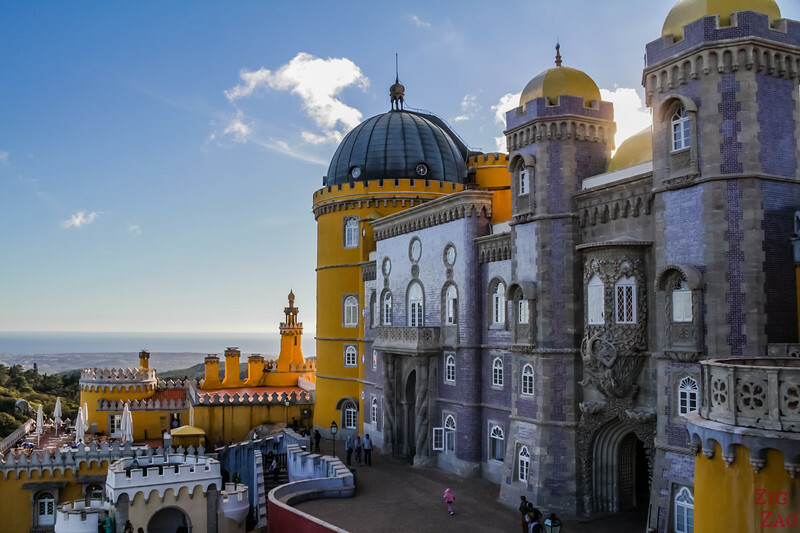 It is easy to get overwhelm by the overall impression of the Palacio da Pena Sintra with the colors and all. 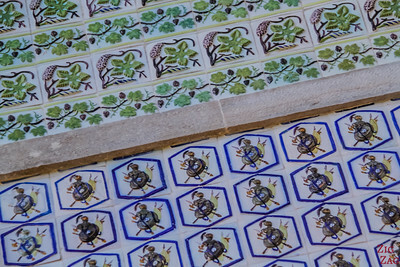 But take the time to look closer at the details, especially the tiles. 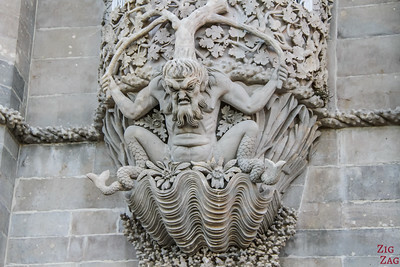 They are quite unique! 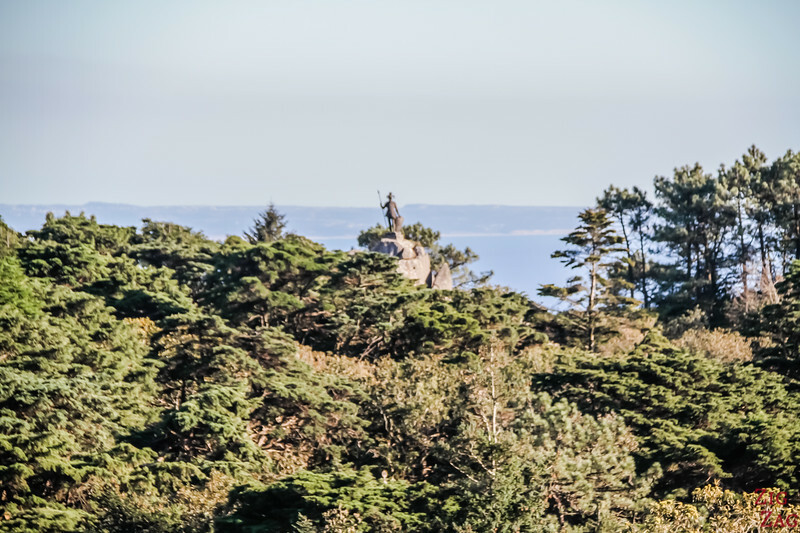 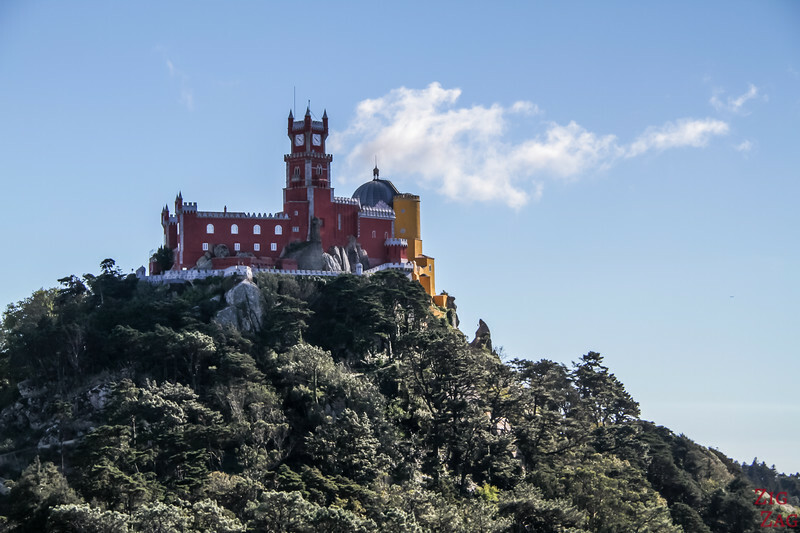 Originally only the Chapel of Our Lady of Pena was built on top the Sintra hill. 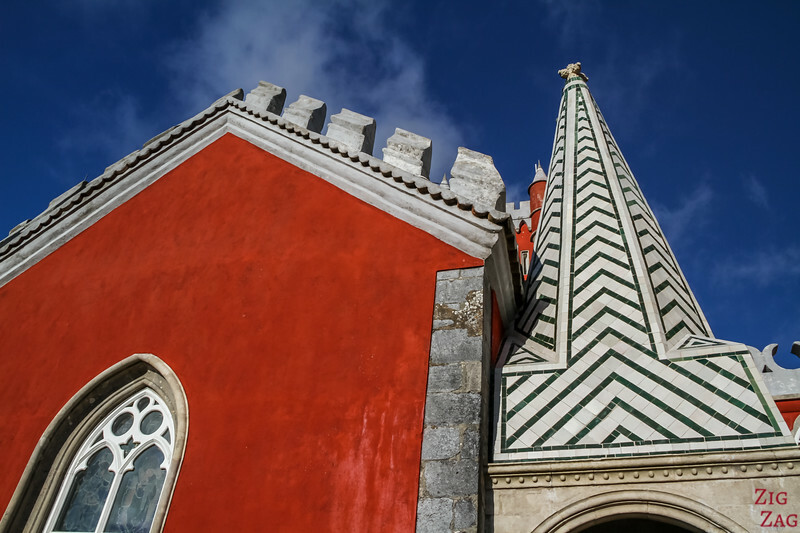 Later a monastery was added but destroyed by lightning and the 1755 Great Lisbon Earthquake. 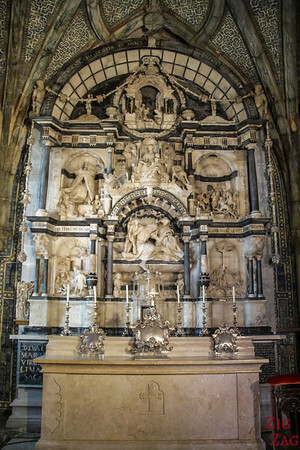 But the chapel remain standing with its impressive work of marble. 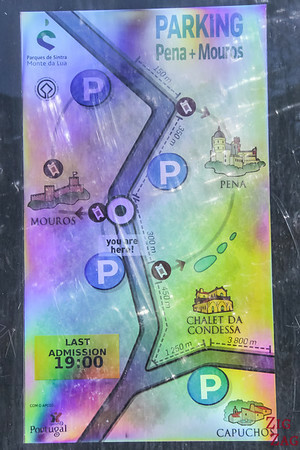 Inside again, the more recent pieces are colorful. 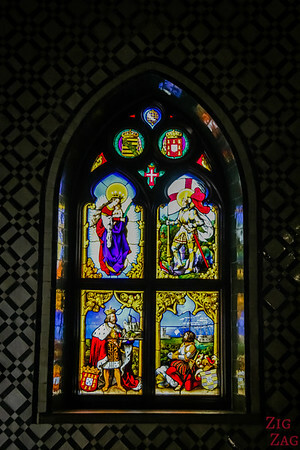 The Stained glass window was particularly bright! 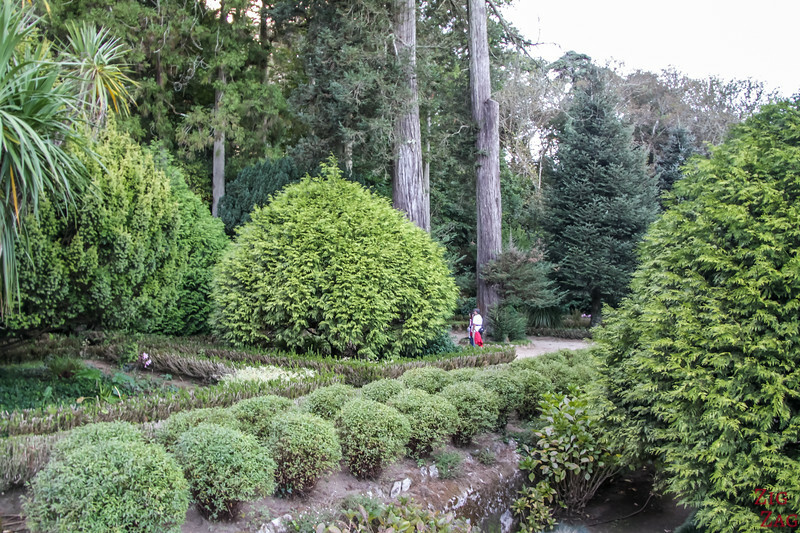 The park surrounding the Sintra Pena Palace is big. 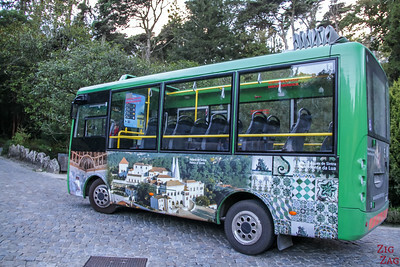 You don't have to take the bus up and down you can also explore on foot to admire the forest, ponds, flowers and small waterfalls. 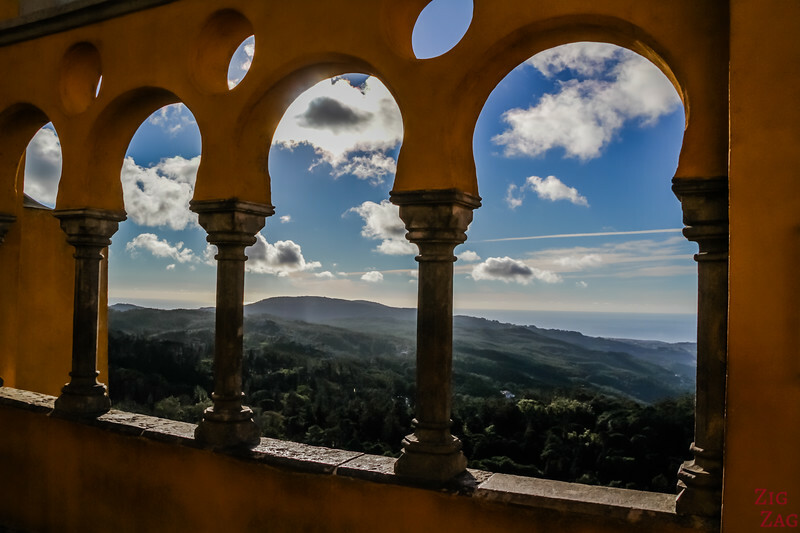 Another advantage of visiting the Palacio da Pena Sintra is the views you get from up there in the hills. 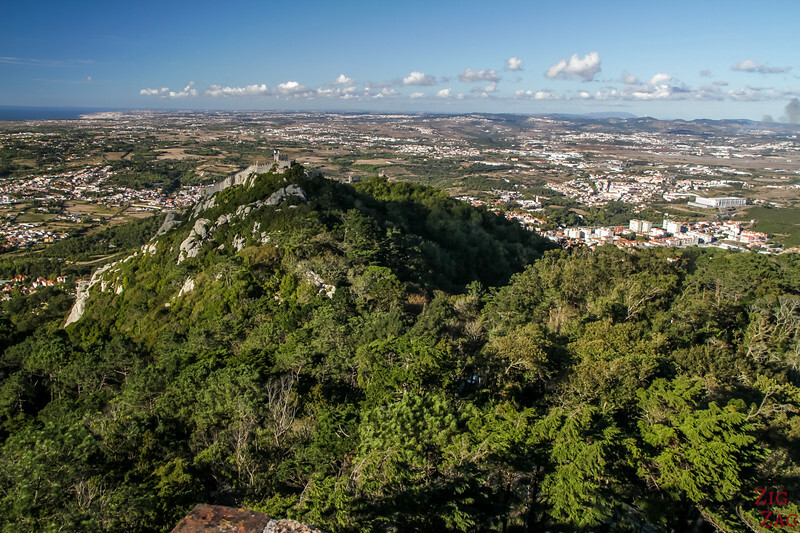 In every directions, you get unobstructed views as the Sintra mountains are the only ones around. 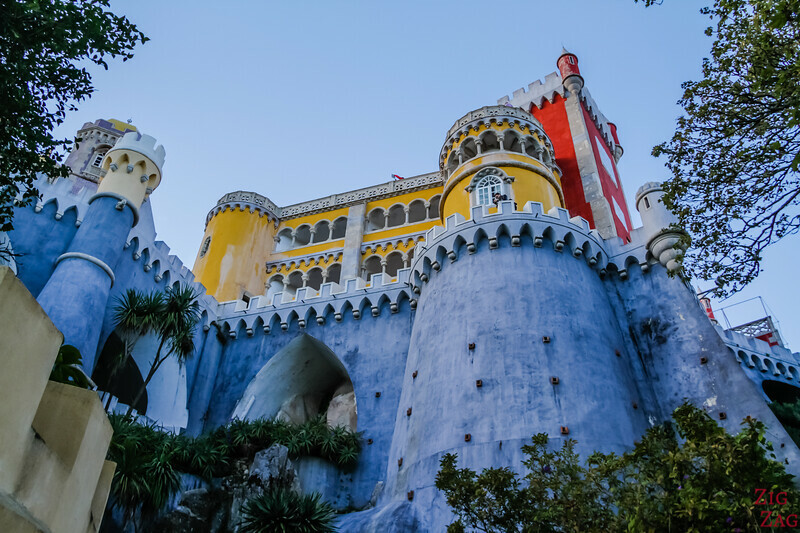 The Pena palace is on top of hill - you can walk from the city center but it is quite steep!